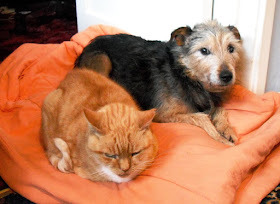 A slight blip with the broadband this morning meant I had to switch off for a while when I was half way through this post. 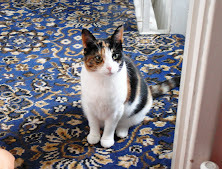 Never mind, I got to do a load of washing, and dyson the stair carpet. The washing is drying nicely in the brilliant sunshine and will need fetching in soon. 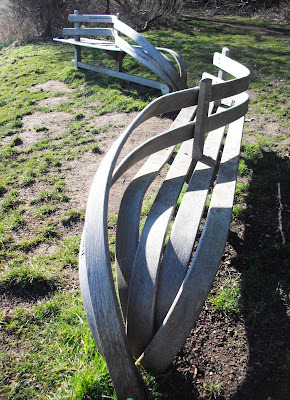 In the meantime, I've managed to upload the rest of the photo's from my day out yesterday. I decided to do another walk over the other side of the bridge, this time paying the £3 toll and driving across. Time was of the essence and I didn't want to faff around waiting for buses. It's a short driving time from here, only takes half an hour. I parked my car at Welton, which is close to the small town, or is it a large village, of Brough. 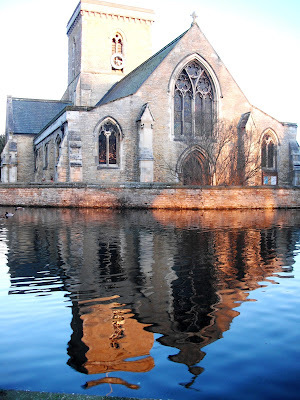 I have been here before, there is a lovely church next to the pond. I set off along a minor road, which runs parallel to the main A63 Trunk road. I noticed that the drone of the traffic was with me for a good part of the walk, it's a very busy road. 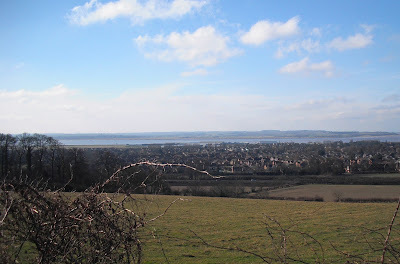 The first pic shows the views over Brough and across the river, I can see the cement works at South Ferriby. A little further along to the right, I can see the windfarm near Normanby, a couple of miles from my house. 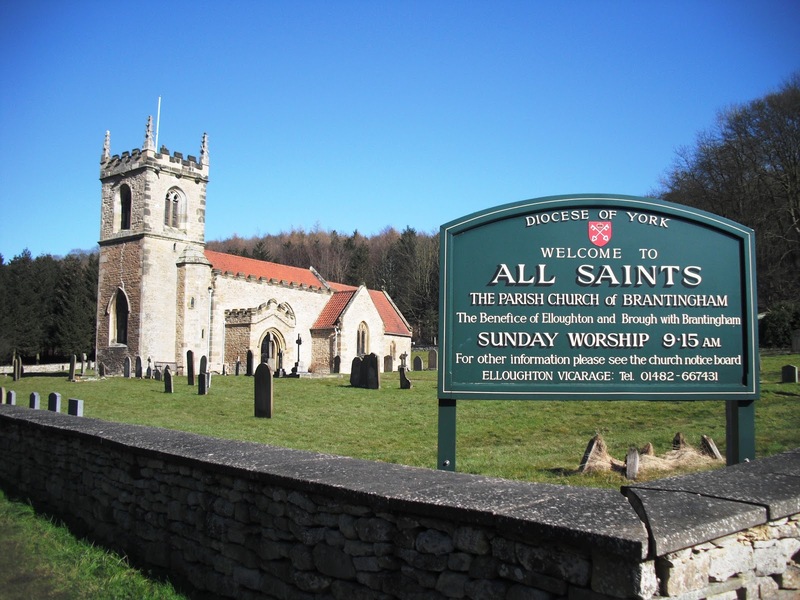 I am in the southern part of the Yorkshire Wolds. Although there are no steep mountains to climb, there are lots of pleasant rolling hills to amble along. I made a short diversion into the village of Elloughton, I just fancied an ice cream, might as well get into the holiday spirit. Back on the road again, I picked up a track heading towards Brantingham. The hens look happy in their dust bath. Next was some woodland walking. I like the way the sun casts shadows across the path. 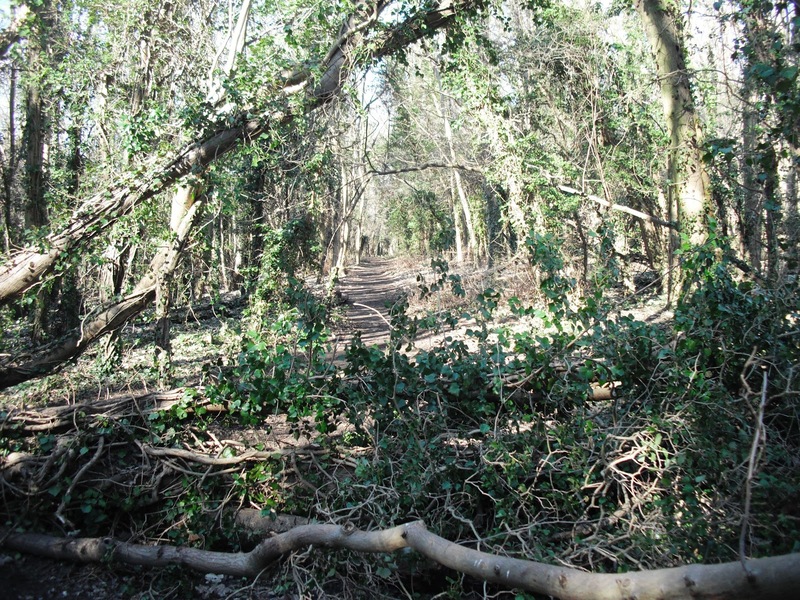 It looked like the way was barred here, but on closer inspection I see a tree has fallen down across the path and no one had been bothered to move it. There was a short diversion round it. This is an amazing seven trunk tree. 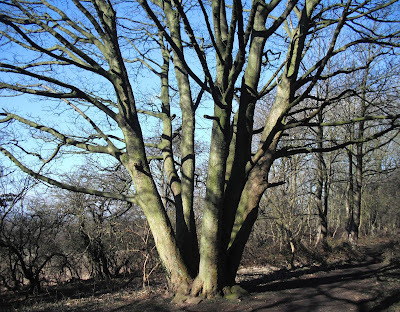 It looks to me that the main trunk has been split when quite young, but I'm only guessing. 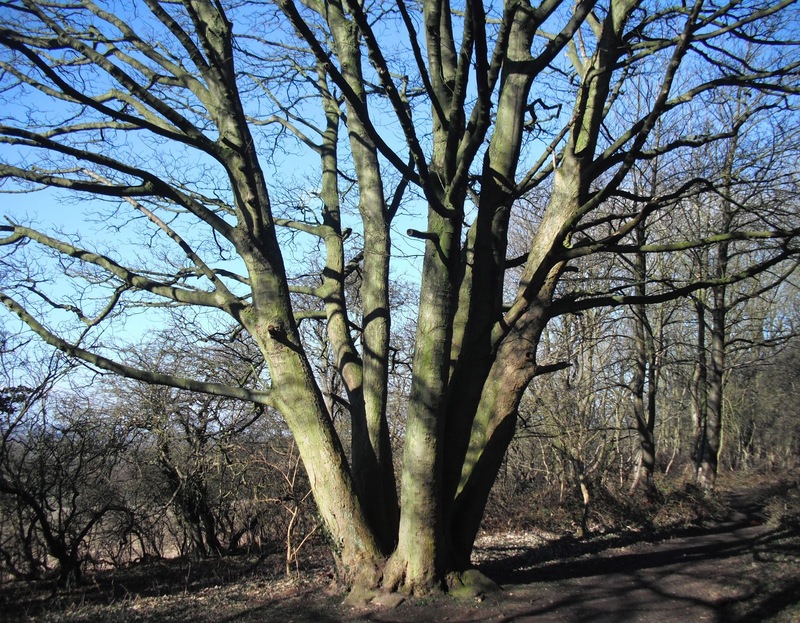 It could be that seven separate trees took root at the same time, close together. Either way, it definately has the wow factor. It was while I was admiring this tree, that I noticed a lone male was coming towards me from the same direction as I had just come. I didn't want to carry on walking with him behind me, so I walked to the edge of the wood to pretend to admire the view across the field, to give him chance to pass me. He seemed to slow down a little, and glanced at me several times. There was probably nothing to be worried about, but I was not going to take any chances, I would rather have him in front of me, than behind. I just got an uneasy feeling about it. 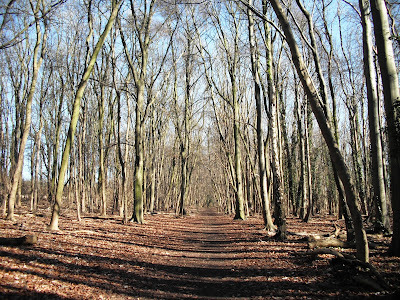 The path through the wood came out on a road, I held back to see which way he would go. He turned right, that's good, I want to turn left. I hid behind a bush and watched him walk up the road. 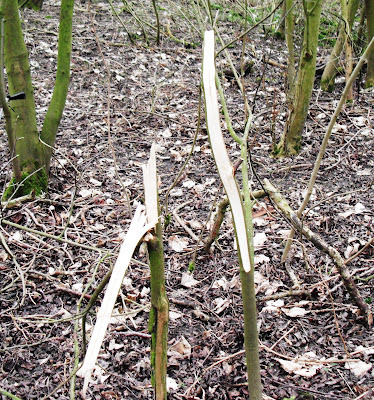 A dog walker arrived on the scene, he looked ok, so I explained why I was lurking behind a bush. We watched the man disappear over the brow of the hill. A few minutes later the man had turned round and was heading towards us. Very strange behaviour I thought, especially as he didn't have a backpack and didn't look like a walker who had took a wrong turn. 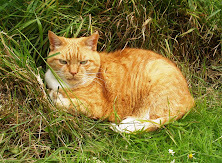 I told the dog walking man I was going into the village, he said he would stay there and keep watch. 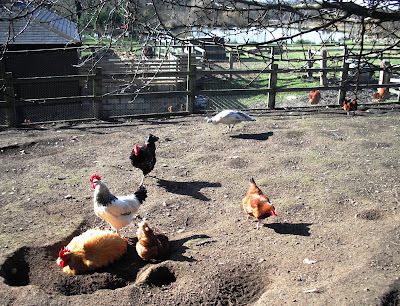 Anyway, I found some work men who were surveying the driveway to a farm, so I hung around there a while. The strange man came down the hill and went off to the left on a road. Probably nothing to worry about, but best to go with your intuition. I was in Brantingham. 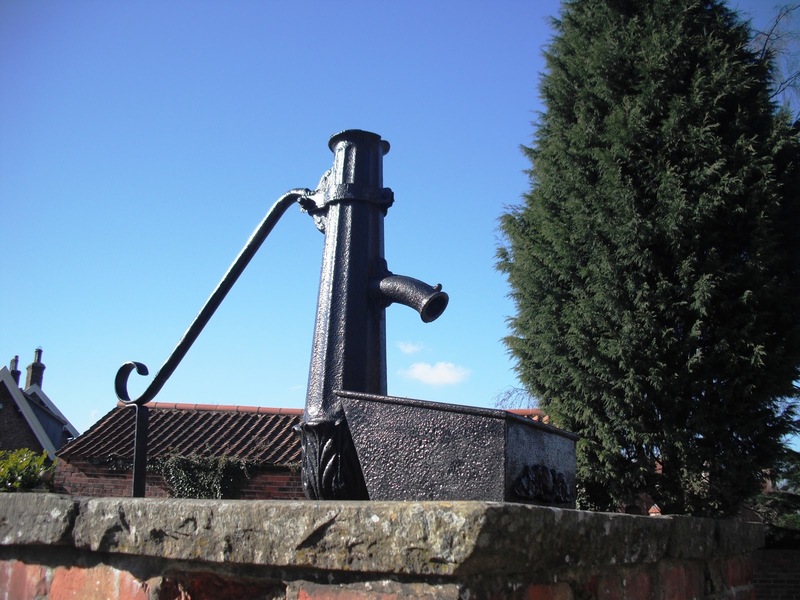 This is the ancient water spout set on a plinth. 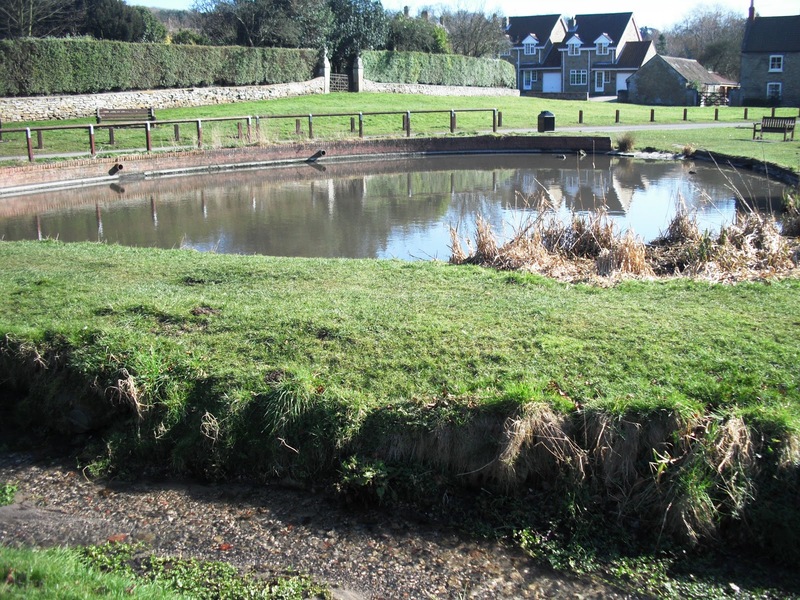 The village pond wasn't very big, only a few ducks, and the water looked a bit murky, unlike the crystal clear water flowing along the stream next to it. I could hear the buzzing of a hedge cutter and found two men chopping back the ivy on the side of this farmhouse. 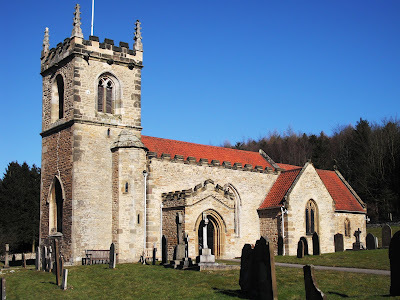 The road out of Brantingham goes through a wood, and about half a mile out of the village is this beautiful church. 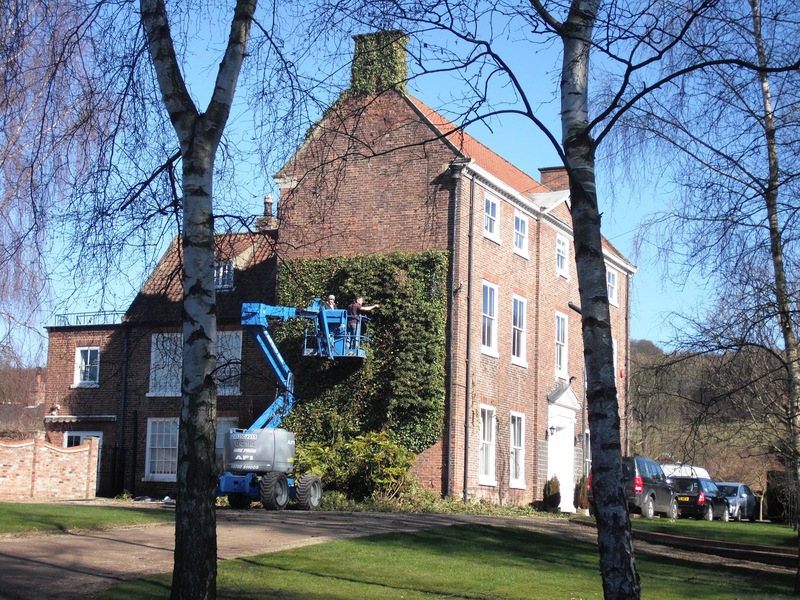 It looks like it has had a lot of TLC, the grounds are immaculate, and the brickwork is sparkly clean. It looks magnificent against the backdrop of trees. I walked through the church yard, and found this frog. It made me smile, how lovely. There is joy in my heart today. Not far past the church, I took a path to the left into the woods. 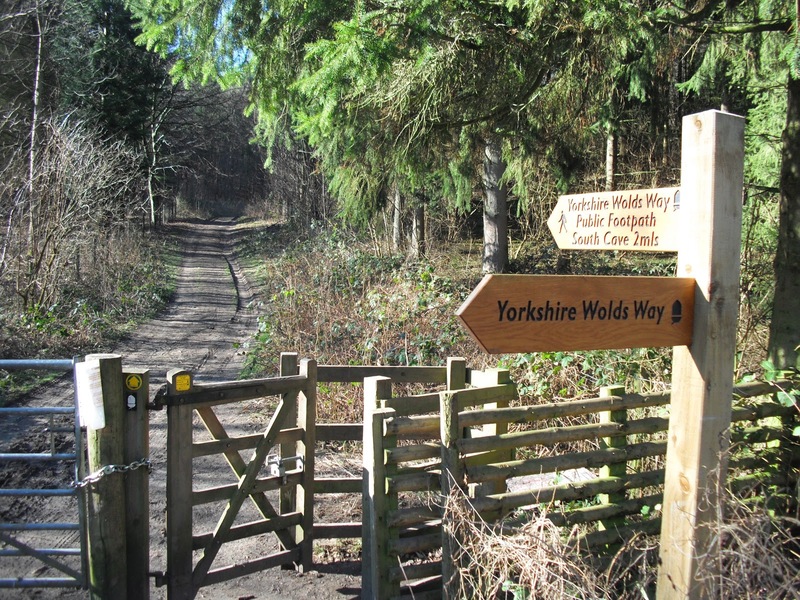 As you can see I am on the Yorkshire Wolds Way, a long distance footpath. Onward and upward I went, there was some twists and turns as the path changed direction. Through Ellerker North Wold, Woodale Plantation, past Mount Airy Farm, and out into the open countryside. Here I am admiring the view over South Cave. 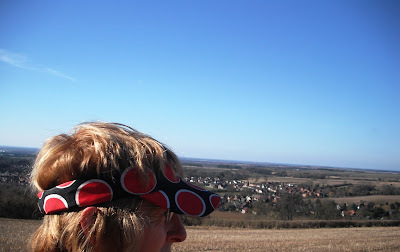 or facing the other way and admiring the wolds. I love them, very quirky. It was time to start making my way back, there was a bit of road walking to do towards Riplingham, then further on I picked up another path and headed back towards Welton. 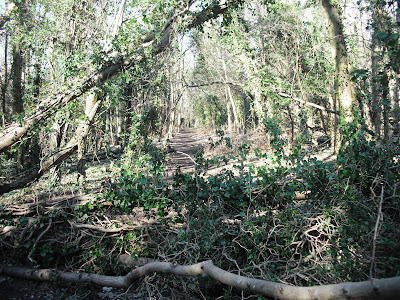 I recognised some of this path, I have walked it before. I looked at my watch, it was too early to go back to the car, so I added an extra twiddly bit on, to arrive back at 5.15pm, just right. The sun was coming down and a beautiful red sky was emerging in the distance. It shone across the duck pond and lit the church up. The ducks were lining up on the church wall, some of them asleep, their heads tucked under their wings, and standing on one leg. How do they do that. 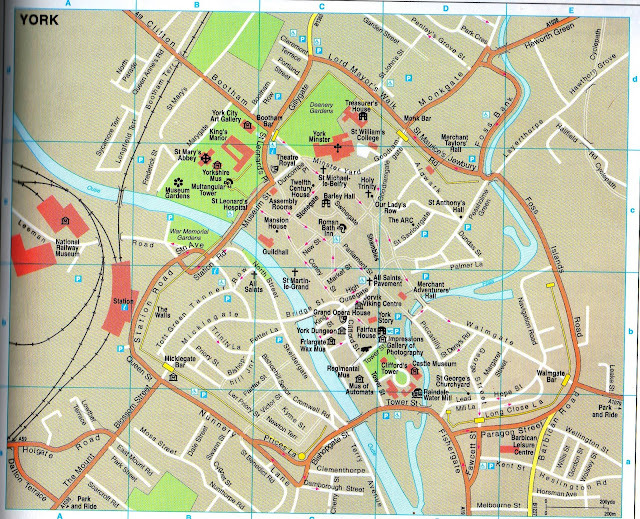 This is a scan of my paper map, I did the walk in a clockwise direction. I couldn't fit the whole route on the screen to do a screen shot. I had a fantastic day and plan to do some more days out to the Yorkshire Wolds. 14 miles walked. Right, must dash, need to go to town. Got to pay my gas and electric combined bill, it's £122 and a bit for the quarter, 44p less than the same period as last year. So even though British Gas profits are up, they haven't had much from me. I've also got a big fat cheque to pay into my account at Santander. My mortgage capital is on the way down. YAY. There was a job that needed doing yesterday, so I got off my bum and did it. 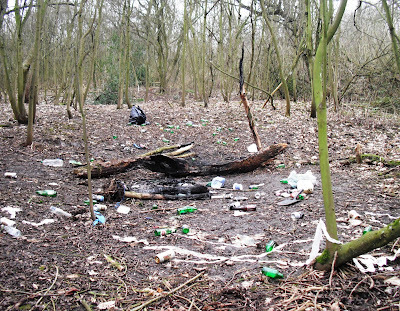 Our lovely woods, which at the moment are looking a bit bare and bleak, have been trashed by a gang of yoofs, and turned into a rubbish dump. 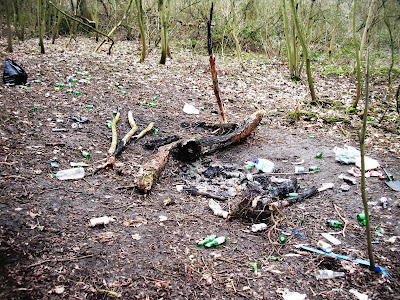 I think they must have been having a party, bottles and cans everywhere, what a mess. I hate to see it like this. 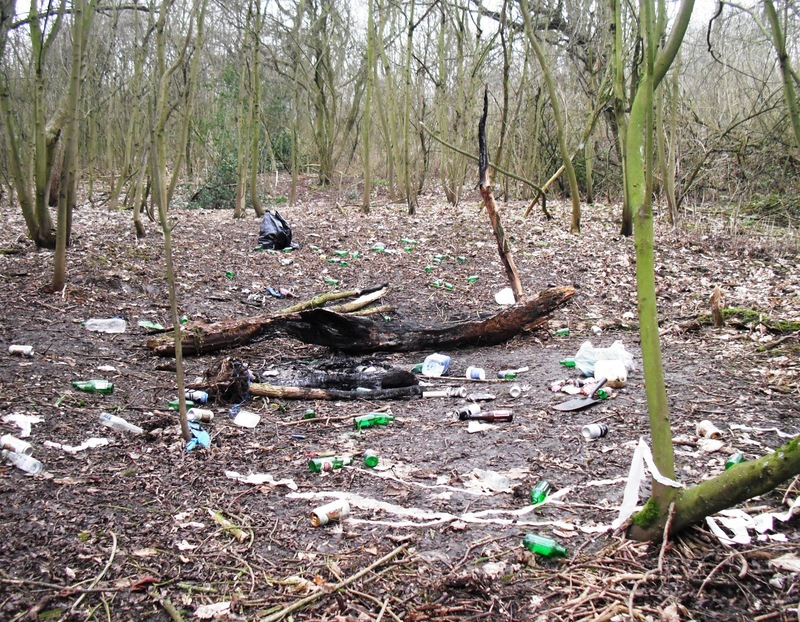 They have no respect at all for our countryside. 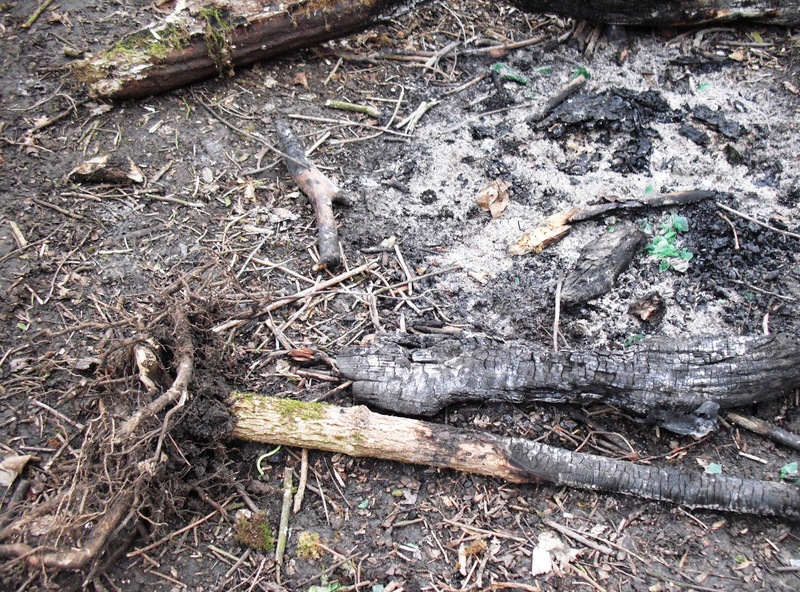 They had a bonfire, the charred remains look awfull. 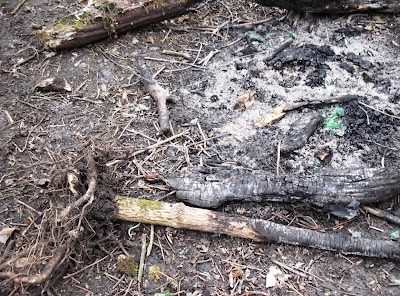 I found a garden spade without a handle, must have used it to dig up this tree to put on the fire. 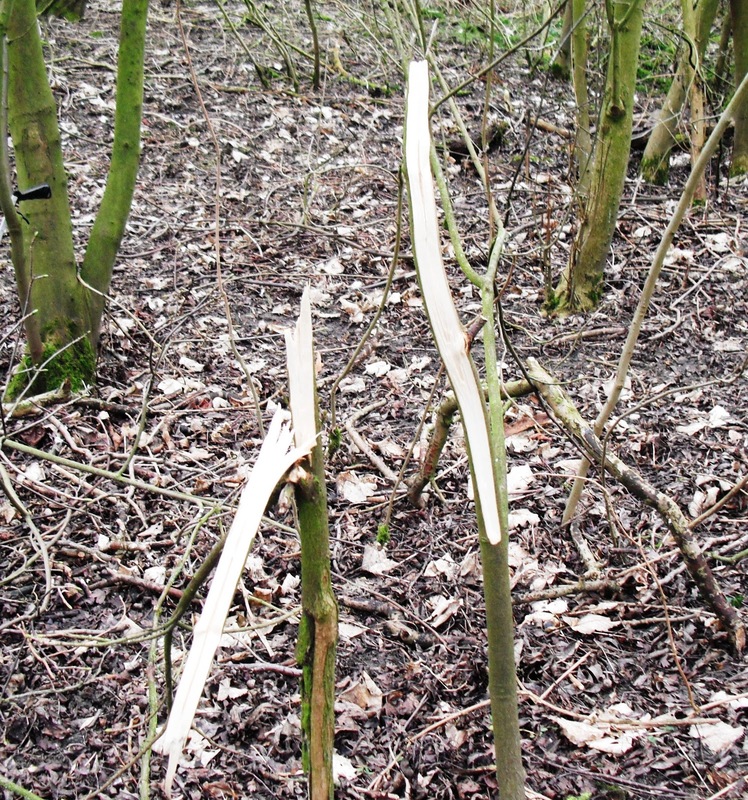 They have chopped down quite a few young trees. How upsetting to see the destruction. 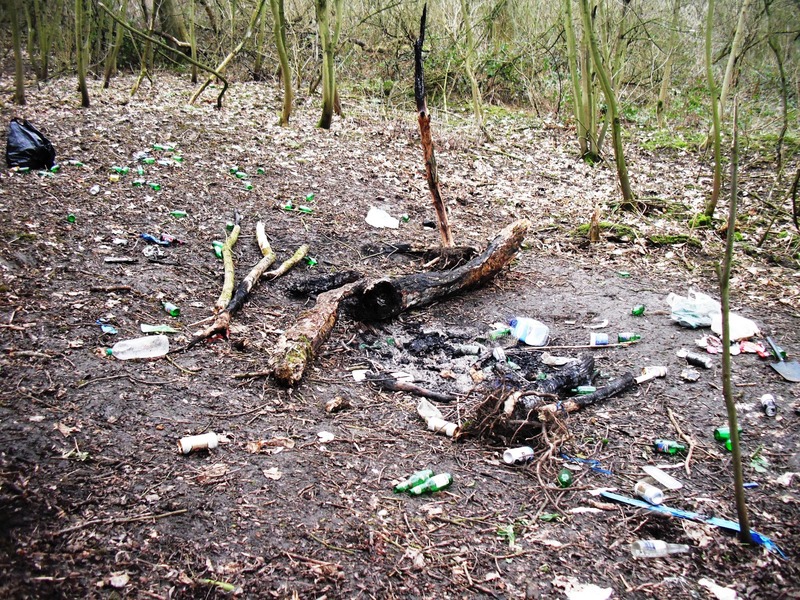 I have no problem with people using the woods for recreational purposes, but why can't they tidy up and take their rubbish with them. And why do they have to destroy and flatten everything in their way. I do despair sometimes. There will be nothing left for future generations to enjoy. 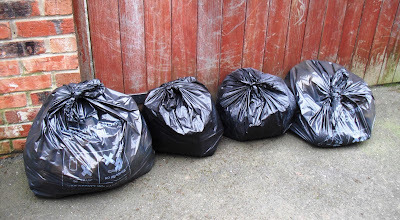 It took me two hours to pick up all the mess, and carry four heavy bags up the steps to the top. I counted 50 small green beer bottles, plus loads more bottles, and lots of cans. There was aerosols, evidence of substance abuse, and food wrappings. 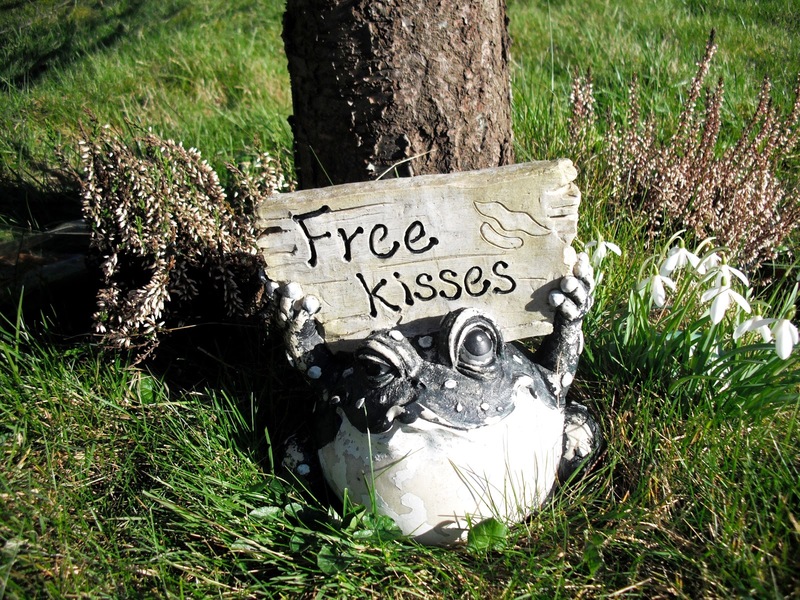 I have left them at the end of the allyway near the posh houses, someone else can deal with it now. 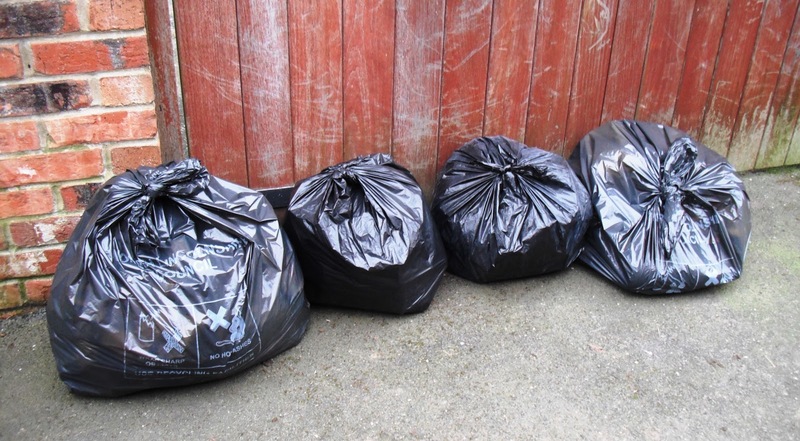 The council bin man will probably pick them up next week when he comes to empty the dog bins. If somebody wants them moved before then, they can ring the council. This was a lunch from last week, didn't get round to posting the pic. 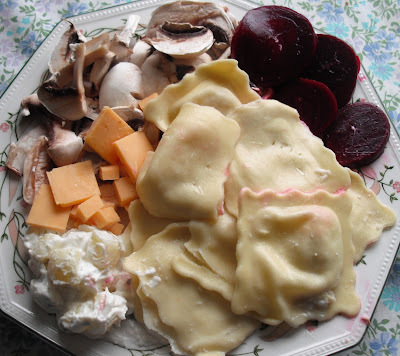 Raw mushrooms, beetroot, potato salad, cheese, and Italian five cheese ravioli, reduced on a yellow sticker of course. Very nice. 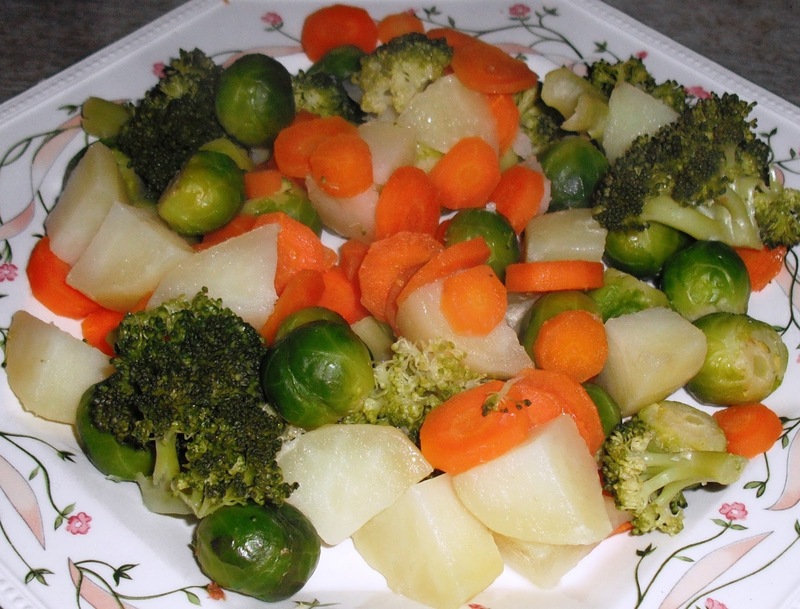 Last night my favourite dinner, steamed sprouts, brocolli, carrots, and potatoes. Delish. Looks like the makings of a nice day, better get my skates on and get out there, best not waste it. My friend Graham gave me his Ramblers magazine yesterday, he passes them on to me when he has finished with them, saves me paying to join. I then pass them on to Paul, saves him paying to join also. This leaflet dropped out which caught my attention. I usually skim and chuck most leaflets, but this looked like a particularly good offer, worth further investigation, I thought. 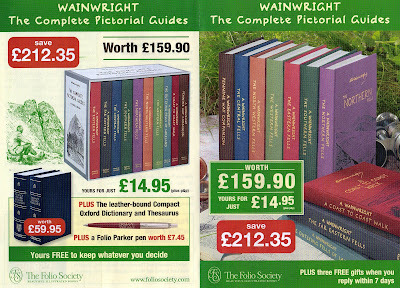 The complete Pictorial Guides by Alfred Wainwright, for only £14.95. 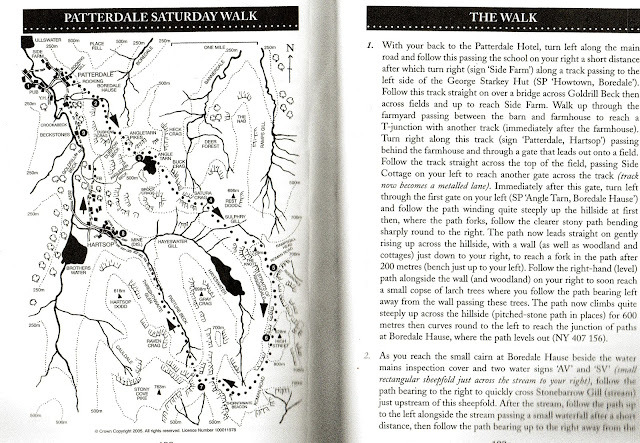 Wainwright is a legend, he spent twenty years walking the Lakeland Fells, writing up his guides. His books have inspired thousands of people to take up walking, and this collection would be welcome on any enthusiasts bookshelf. 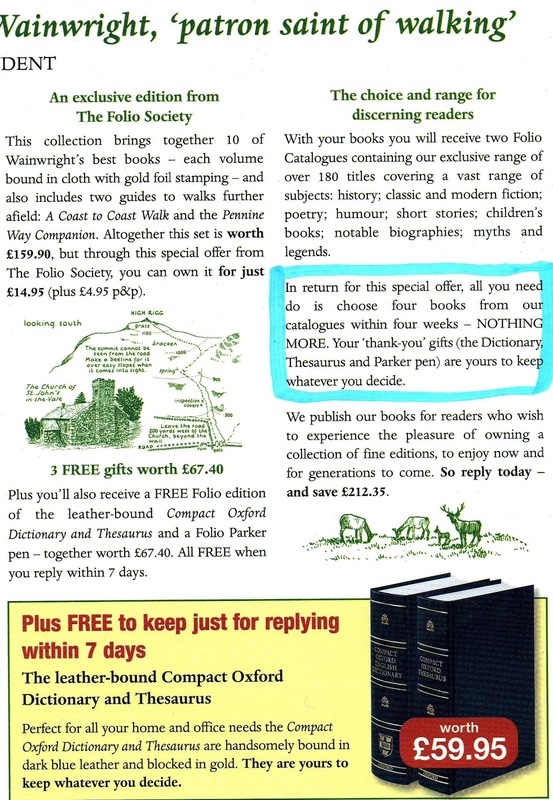 Right, I'll send off my cheque for £19.90, which includes P & P, and wait for my book set to arrive, along with the free gift of a compact Oxford Dictionary, a Thesaurus, and a Parker pen. Can't be bad, just look at the money I'll save over the normal price. But hang on a minute, surely it can't be that simple. Surely there's a catch in it. Read on, yep, there is. In exchange for this wonderful offer you have to agree to buy four more books over the following four weeks, the cheapest being £17.95. OK, so what can you get for £17.95? I've been on the web site to check out the titles, and to find a book at that price is like trying to find a needle in a haystack. Even if you did find four books, with titles that you might be interested in, 4 x £17.95 = £71.80 + I'm guessing £5 P & P for each book, gives a total of £91.80. So, in total, the whole caboodle, boxed set, plus four books at £17.95, would cost £111.70. I suppose if you add in the free dictionary, and thesaurus, and pen, it might be an ok deal, if you had the money lying around waiting to be spent. But what if you don't need those two books and pen, and struggled to find any books of a subject you liked at £17.95? You would end up either buying books you didn't like or need, or paying a lot more for books that you would like. The £17.95 is a carrot to hook you in. What galls me is how much they say their books are worth. It seems to me they make the prices up to make the offer look good. Mind you I have lost touch with book prices, it's many years since I last bought one from a real bookshop. How come a dictionary and a thesaurus costs a whopping £59.95, good grief, I'll go and get one from the discount bookstore, The Works. I don't know how they arrive at the figure of saving £212.35. What most people forget when they order online or through something like this, is the cost of P & P. I always add it to the price of the goods, because that's what it's going to cost me. Fair enough if you live in the sticks, paying the P & P would probably be cheaper than getting in your car to go and buy whatever you want. I am near enough to town to be able to go shopping. Anyway, the moral of this story is to read the small print, then bin the leaflet. Don't get hooked into buying something which you will live to regret. I don't need the books anyway. Please excuse me if I add a polite request here. I am getting over 100 spam comments daily. Most go straight into my 'spam' box as filtered by blogger, but quite a lot don't and end up in the 'comments pending' box. I have to sort these out, which takes time. All the spam comes from Anonymous, and are generated automatically by machines. I don't want to stop allowing Anon comments because I know there are a lot of genuine readers who use that facility. Could I ask that everyone who does use Anon, to start their comment with their name. Something like, Susan here, Carol here, etc. It would help me enormously to whiz through the checks a lot quicker, I don't want to zap genuine comments, and this would help me to spot them. If this works I won't have to disable the Anon option. Thanks very much. Good morning, I thought I would carry on the map theme a little further. 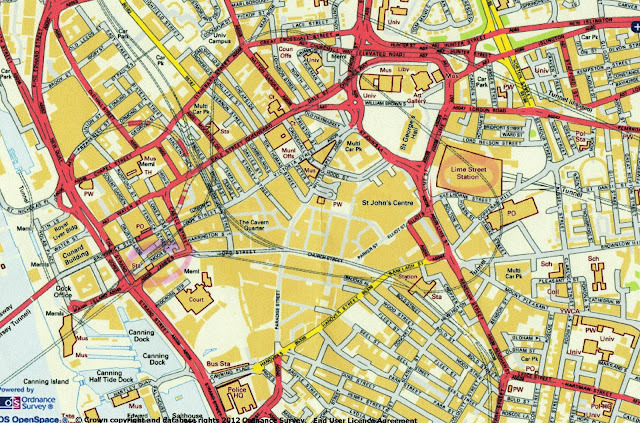 There is such a lot to say about maps, the most important being, to understand how maps work. You need to buy one, or print one off, and read it, then go out there and use it. People ask how do they start a walk. The first thing I consider is, how long do I want to be walking for. If it's a couple of hours I stay local. No point in driving an hour, walking for two hours, and driving back an hour. I want to walk at least five hours, preferably seven or eight, if I am going to drive for one hour to get there. Best make a day of it. If the distance to get to the start is even further away, then be prepared to make it a longer day out, or to stay overnight somewhere. Figure out your starting point by looking at the map. Look for a landmark where you might be able to park your car. If travelling by train, then the station is the obvious landmark. On this map of Kettlewell there is a church, a Youth Hostel, and a car park near the bridge. As I don't like paying to park I find a place in the street with no restrictions, and keeping in mind not to annoy the residents. Some popular walking places get very busy in the summer, the people who live there need to carry out their normal day to day activities without the problem of squeezing past badly parked cars. Don't annoy the farmers who travel around in big tractors, don't park in gateways, even though they don't appear to be used very much. Don't park on private land, or on bends, or at road junctions. Use your common sense. I have stayed at the hostel in Kettlewell, so I know where to park. 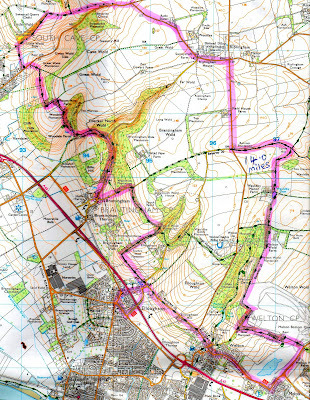 As you can see in the map, there are lots of footpaths leading out of here, and going by the contour lines, some of them climb up the side of a hill pretty steeply. I find it's best to climb up in the morning, and head back down in the afternoon. 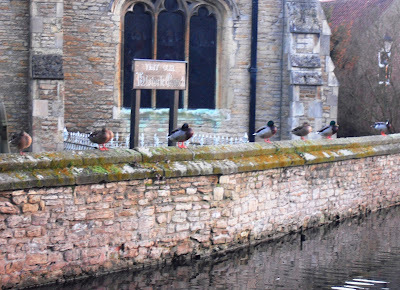 There is also a footpath alongside the river, so if you prefer a valley walk, set off along the river bank. Those wavy black lines are rocky craggs. Don't try and climb them if you are a beginner. 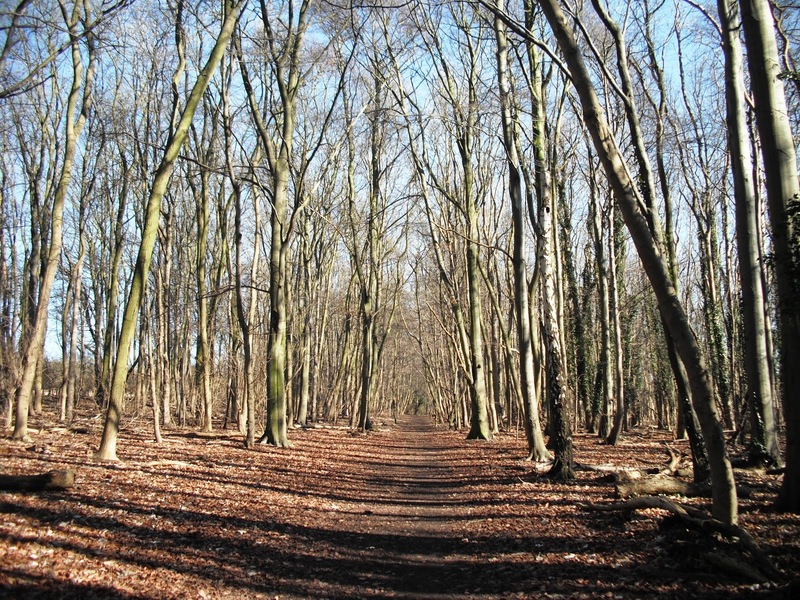 Look for the wooden finger posts pointing in the direction of the path. Those two paths on the right follow the line of the water coming down from the top. The two paths going straight up have thicker red dotted lines, these are bridleways and are likely to be rough, man made, wide tracks, possibly tarmac. So, get yourself to the starting poing, with your days food and drink in your back pack, and set off. Pateley Bridge is another good place to go walking. As you can see there is a wide choice of footpaths. It's also a very nice place to potter around for a couple of hours, you could spend a whole day just walking all the footpaths on this small section of map. When I walked there, I parked in the car park next to the bridge, because my passenger very kindly offered to pay. It is a very busy town in the summer, so to get free parking in the street you would need to go a little way out. It doesn't really matter where you park, as long as you remember where you left the car. I think maps like this, with plenty going on, are really interesting to read. When planning a walk round here I would make a note of interesting features that I might want to take a look at, the several churches, walk along the river, the museum, Outdoor Centre, the weir, I might take a walk up Madge Hill, or to Fishpond Wood. After deciding which direction to go in, then searching for the path on the ground and following it, and arriving where you want to be, is so much fun. Your confidence in map reading grows over a period of time after lots of practice. I see a map like this, and think, I want to go there. I have mentioned using Bikehike to work out how many miles I have walked. Here it is. When you open it up it looks like this. 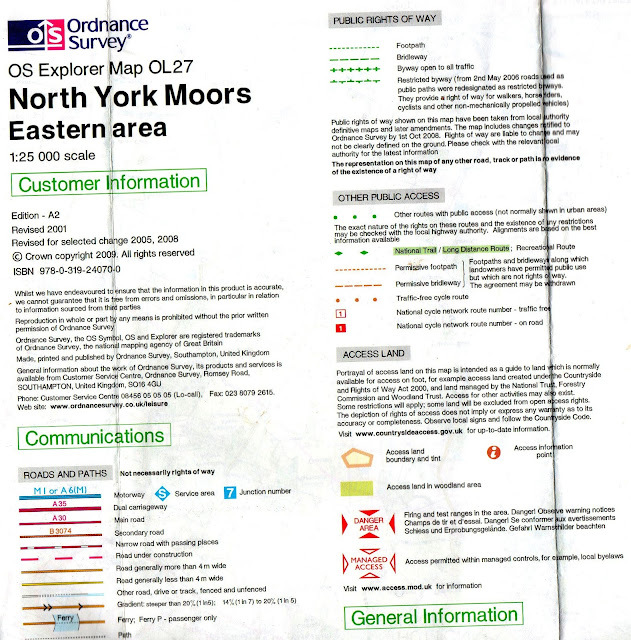 A small os map on the right. 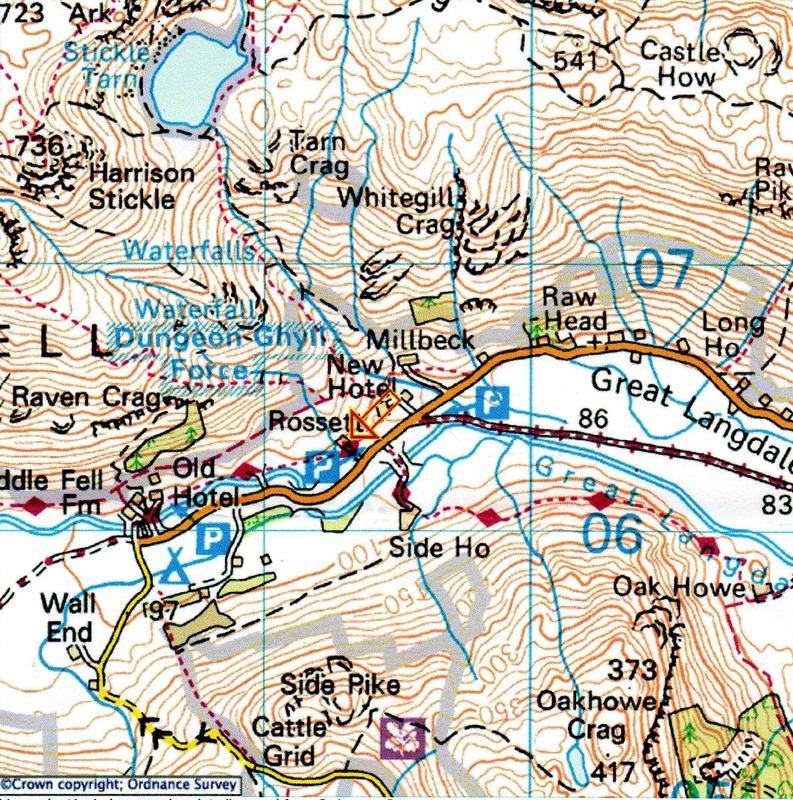 Hit the 'toggle map size' button and the os map is bigger. This is Salt End near Hull, where I was last week. You will need to put your start point in the little box at the bottom on the left, to get the area you want on the screen. Either a post code or place name. You can zoom in and zoom out. You use your mouse to plot out your route. 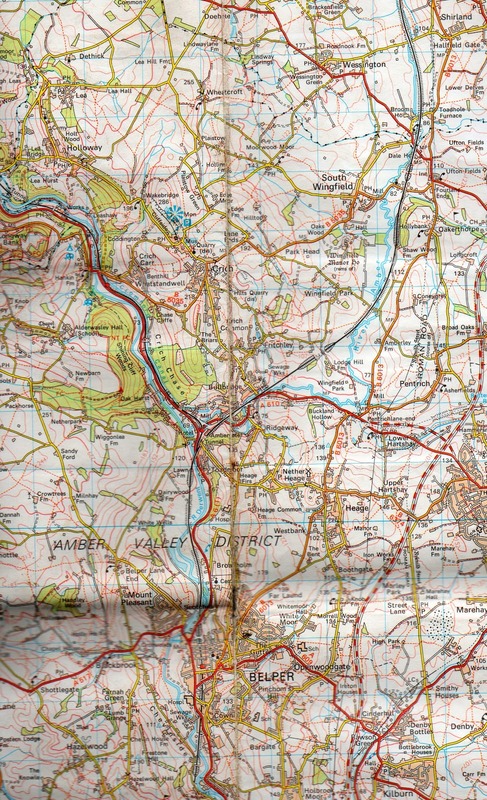 I mark mine on the paper map with a coloured felt tip pen, as I walk, so I can see exactly where I have been. Right click the mouse at the start and a little green balloon will appear. Then go all along the route, clicking as you go. 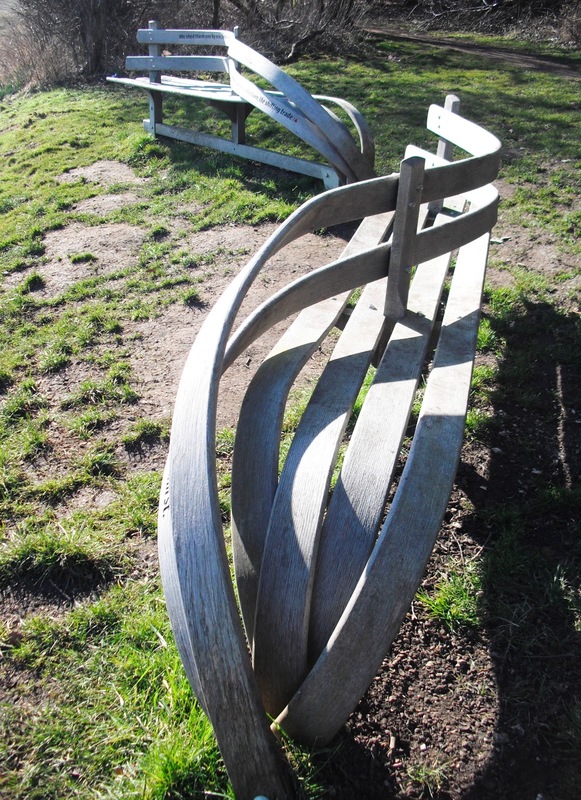 It will only draw a straight line, so you need extra clicks to go round bends. The red balloon follows you around. When you get to the end of the section you want to measure, stop. I started at the chemical works and finished at Paull, just over four miles. As you can see, I reached the end of the path at the railway line, then went down a track and picked up the road at the dock entrance. After a bit of road walking I was able to go on another path to Paull. You can use Bikehike for any type of journey, short distances at street level, or longer distances on trunk roads and motorways. Have a play with it. Plot out a two mile walk from your house which you could do every day as your daily excercise. Work out several routes to combat boredom. I know that if I set off from home and walk down the hill to Old Row and back, that is one mile. I also have a three mile walk around the outskirts of the village. I have put together a few vidoe clips here, found on yootoob, about maps and navigation. I mentioned grid references, there is a short vid showing how to do that. Hope this is usefull. Toodle pip. Good morning. Yesterday Campfire asked what is a screen shot. This usefull way of posting a picture of a screen shot into a blog, was brought to my attention by Roberto in November, when I struggled to post pictures of the gorgeous what's his name from the TV programme Small Spaces. See, I've forgotten his name already, ha ha. Well now I've worked out how to do it from the web site link Roberto sent to me. Good init? Here is a little tutorial in case you want to do the same. First get the picture on the screen that you want to copy. On the bottom of the keyboard is Alt, you need to hold it down, while at the same time pressing the key PrtSCN SysRq, it may have the words Print Screen on it. This key is on the top right hand side of the keyboard. Dun it? This copies it to a clip board. Then open a new Paint doc, hold down Ctrl with the left hand, while pressing the letter v on the bottom row. Magic, the screen shot appears. You can play around with it at this stage, with the Paint programme if you want to. You then need to save it where you normally save your pics, so click on Save as at the top left, and choose your place. 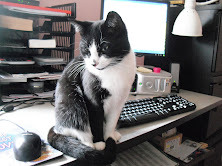 And there you are, When writing a post you collect it from there in the normal way and insert it in the post. If you don't want all the paraphernalia around the picture, you can use your editing programme to crop it out. You don't have to post the whole thing, just the bits you need. Like this. Hope this helps. Toodle pip. PS. Just come to me, it was William. Kath asked about taking a screen shot from a home made video. I play mine on Windows Media Player. There doesn't appear to be a button for freezing a frame. There is a button on the bottom which says Turn on repeat, so I did do and it slowed the video up. I then did the Alt and PrtScn keys, and followed the rest of the procedure, and it worked. Next I did it again, this time letting the video run as normal, and it worked again.The only thing is that I couldn't stop the video in advance of saving the shot. There's a stop button but no pause button. If you were to save it to yootoob you could pause at exactly the right second to get the pic you want. I got a bit sidetracked while gathering a few maps together, found a lot of useful tutorials on yootoobe on map reading and navigating. Right where to start. 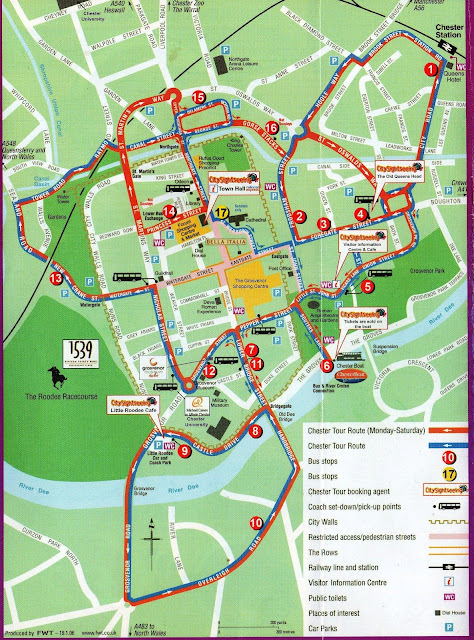 Most people will be familiar with a tourist type map which you can use to find your way around a city or town you haven't visited before. I always head for a Tourist Information Office before I start wandering around getting lost. They are usually sign posted and situated in prominent positions. Once you have got your map, you need to pinpoint exactly where you are on it. Position yourself at a road junction, then find that spot on the map. Sometimes there will be an index to help you find it, or you may just have to go over the whole sheet untill you spot it. When you have your starting point you can plan where you are going to go next. Well that's straight forward enough on a big scale map where there are lots of landmarks. So, on this map of York, if I wanted to go from the Nunnery Lane car park to The Minster, I would walk up Micklegate, past a car park on the left, carry straight on, it then changes to Bridge Street. Then the road goes over the river at Ouse Bridge. On the other side I would turn left up Coney Street, past the Guildhall, turn right onto Stonegate, past Barley Hall, and The Minster is in front of me. An easy peasy map to read. Here is another easy one. 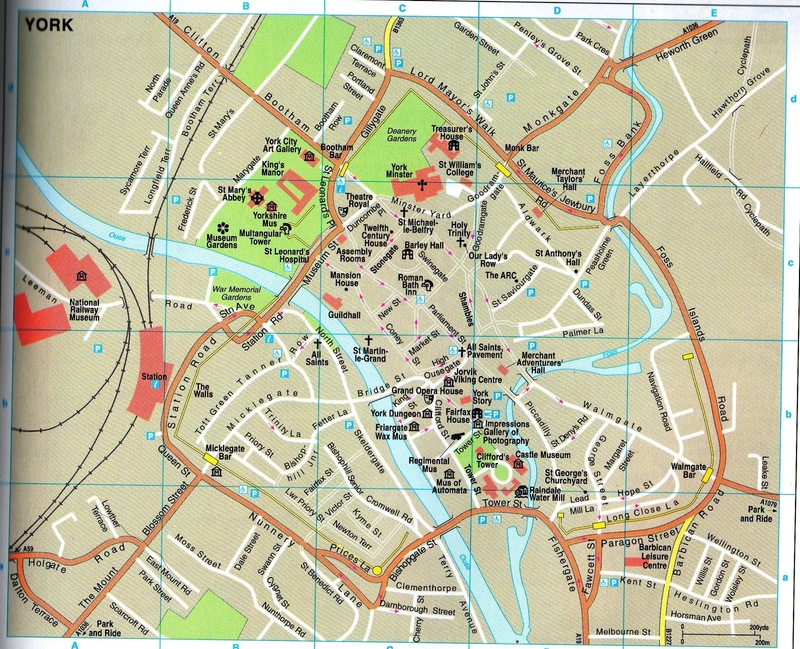 I picked this Chester map up last year as I was passing through. It was useful to visit a few places in the limited time I had available. Now this map of Liverpool I printed off, because I needed to walk from Lime Street Station to James Street station, to catch another train. I wanted to go straight there, and not waste time getting lost. You will notice that there are a lot of minor streets which aren't named. If you needed to know the name of every single street you would have to look for another map which has the information you need, because if you zoomed in on this one it would only enlarge what was already there. Maps used for walking have a legend. It is best to familiarise yourself with what all the dots and dashes, the symbols, the squiggly lines, and the different colours mean. 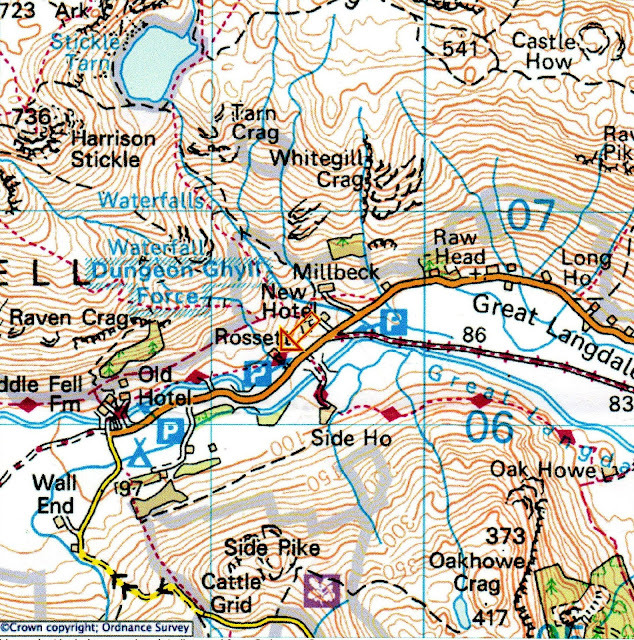 On the Ordnance Survey maps there is such a lot of information to take in. You won't need to remember every single symbol, just look up the meaning of it if you come across one on the map. The most important ones tell you where you can and can't walk. The public rights of way, and the permisive footpaths which landowners allow the public to use. Another feature which is usefull are the contour lines, these tell you how steep the hills and mountains are, whether it is a gradual slope, or a very steep climb. Here are some examples of some legends. It is best to familiarise yourself with the legend of the map you are using, before you go for a walk for the first time. 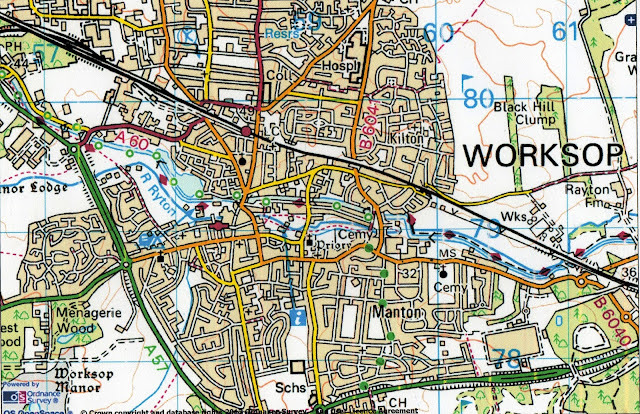 This map of Worksop is an OS map Landranger Series, on a scale of 1:50. 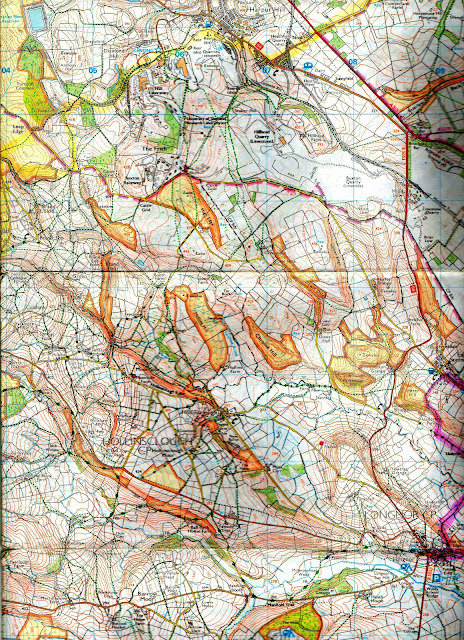 The long dotted red lines are bridleways, they should be wide enough for horses to walk along, but often they are not. The green patches are woods, or sometimes clumps of trees. These can be usefull to check your bearings, in fact any landmarks can confirm you are where you think you are. The railway lines are marked on here. When I walk I am constantly checking the map to make sure that what I see on the ground is exactly what is on the map. You will see some numbers in blue on this map, you don't need to bother with these as a beginner, they are for taking a grid reference. It would be usefull to learn about these later on as they are used to pinpoint an exact location, should you need to pass the information to someone else. I've zoomed in a bit more, to make it easier to read. 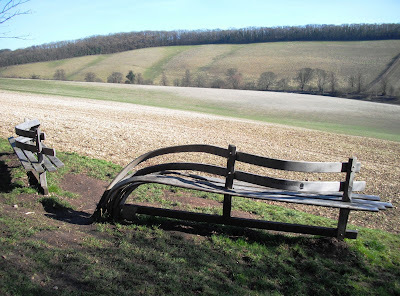 Now I can see the contour line around Black Hill Clump, it isn't very steep. Along the river you can see a red dotted line with red diamond shapes along it. This is a long distance footpath, the Cuckoo Way, running alongside the canal. 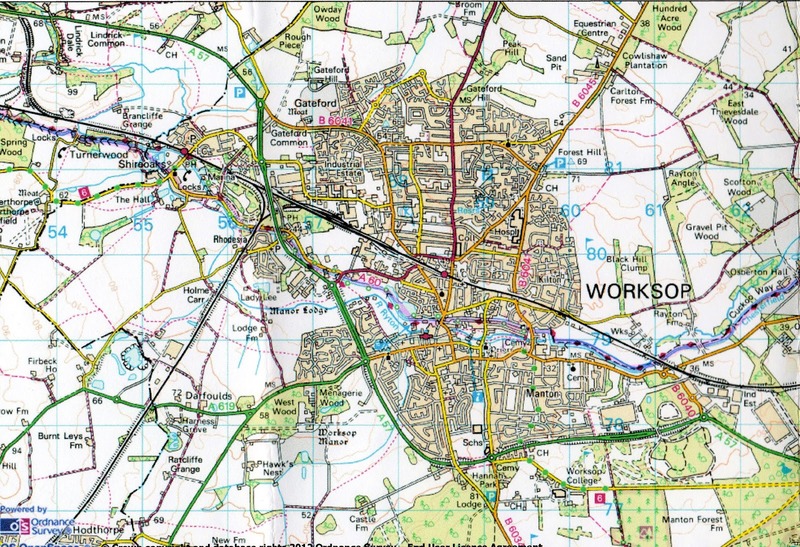 The green dots are a long distance cycle path. 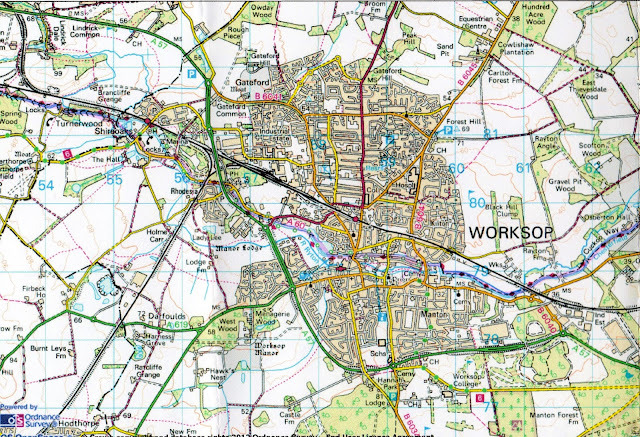 On this map you can see the hospital, college, cemetary, railway station, golf course, school, river, tourist information office, camp site, a public house, sports centre, and church. 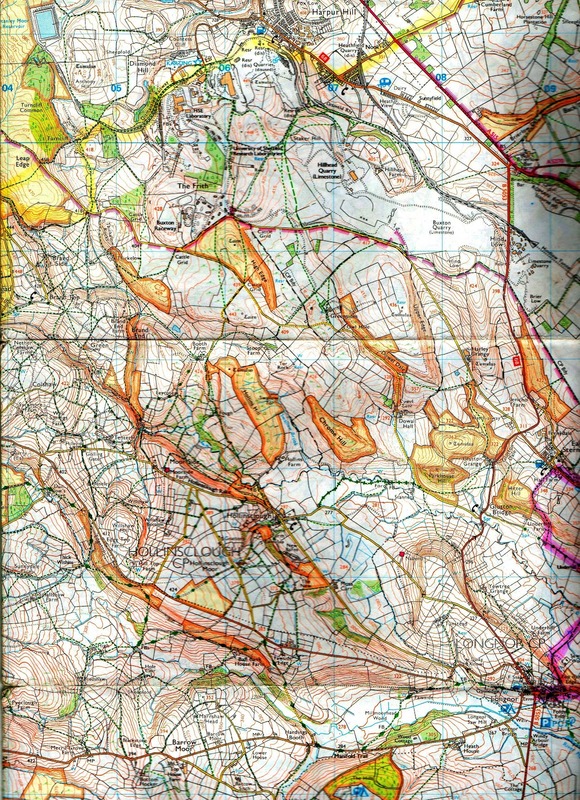 This map has lots of contour lines on it as there are some very steep climbs. It's in the Lake District. The closer together the lines, the steeper it is. The blue lines are the water trickling down fron the mountain top. There are not many trees around here as it's all mountains.The road and the river run through the valley. If you were to look up from the road the mountains would appear to be very steep. The black dotted lines are boundaries. If you stood on the top of Tarn Cragg you would get a lovely view of Stickle Tarn. There is a footpath going up from the road near the hotel to the Tarn. I went so far up that footpath with a group of walkers. They were going too fast for me and I wasn't enjoying it, so I came back down and did my own low level walk. I was pleased I did, because they had horrible weather up there, and I had a lovely sunny day. This one I have scanned and copied from an OS 1:50. This is the scale of map I use for my long walks. It doesn't really have enough detail in it, and I have to squint over the top of my specs to read it, but if I was to go for the 1:25 scale, it would be like carrying a book around with me, far too heavy. There is enough information on these maps to walk from one end of the country to the other. 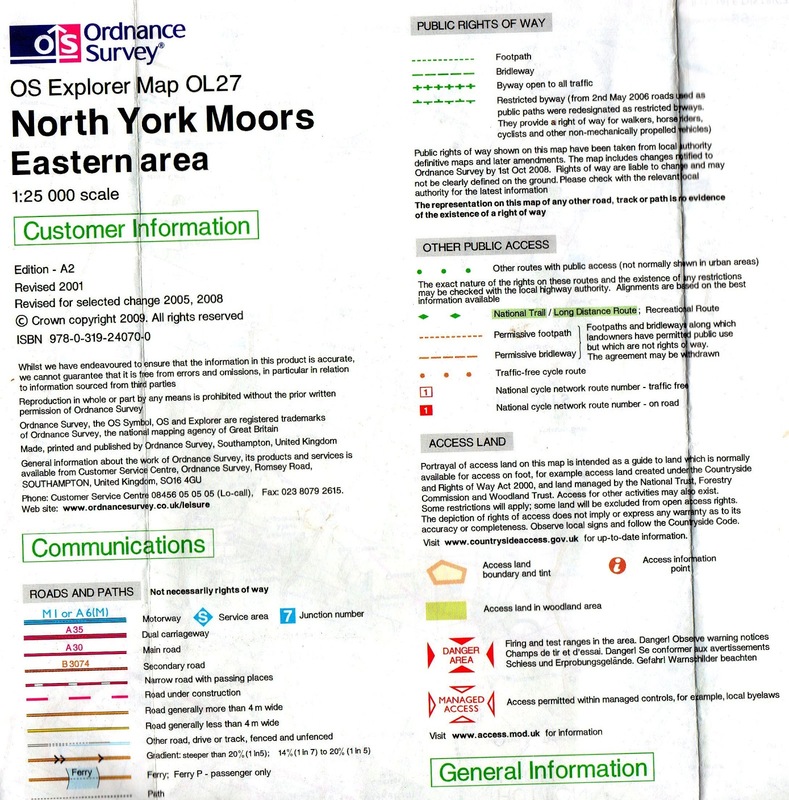 This is an OS Explorer map 1:25 scale. These are much easier to follow, with lots more information. 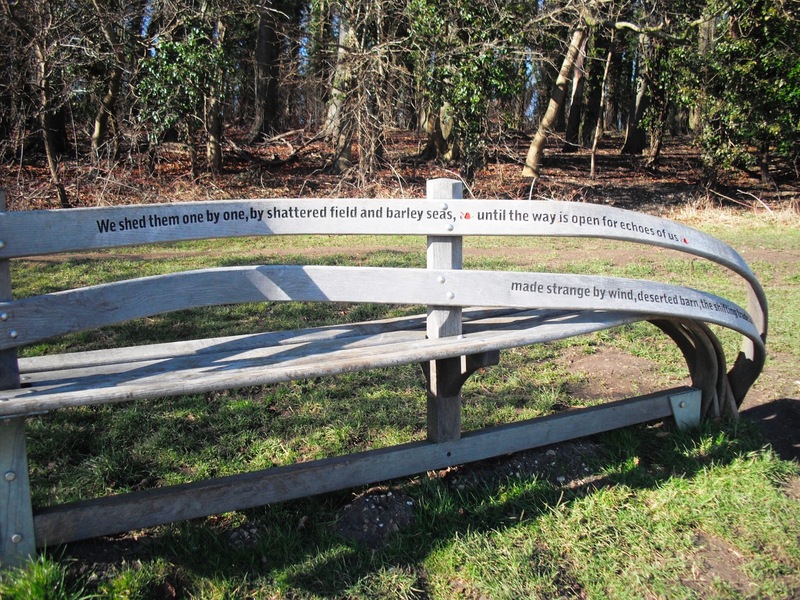 It has all the field boundaries on it, whether they be hedges, fences, or stone walls. There are a lot of guide books available for every kind of walk, whether it be a couple of miles, or a Pennine Way length walk. They usually have a hand drawn picture of the route, with written instructions. It is not a good idea to set off and rely soley on a book to show you the way. It is much better to take a map as well for a back up, or to clarify something you are not sure about. As you get used to maps, you will get a good idea of how far you can walk in a day. The book will say how long it should take someone to walk the route, but you may not walk at the same speed. What if you get half way round it and decide you want to cut it short and take a quick way back. The only option would be to retrace your steps and go back the same way as you came. Not much fun. Always best to take a proper map. While I was writing this post I learnt how to do screen shots, Roberto told me about that little trick on a previous post, so thank you Roberto. There is so much to cover on the subject of maps, I shall continue with some more information tomorrow. Hopefully with some screen shots and videos. Not the Domestic Goddess, just how I do things. Take a virtual world tour with this site. Two villages, one town, and one hamlet.